Looking forward to winter soup or stew brightened by the addition of herbs harvested from your own garden? You’ve probably been plucking and clipping all summer, but as the days grow shorter and the first frost threatens to kill your more delicate plants, it’s time to for an herb harvest. The good news is that the remaining leaves can be dried, frozen, or preserved in oils and infusions. As with other plants, herbs can be either annual, perennial, or tender perennial. To extend their seasons a bit longer, annuals—such as Basil, Dill, and Cilantro—can be dug out of the ground and potted in containers placed inside sunny windowsills. Depending on your Climate Zone, perennial herbs, such as Lavender, Spearmint, Oregano, and Chives should come back each spring. 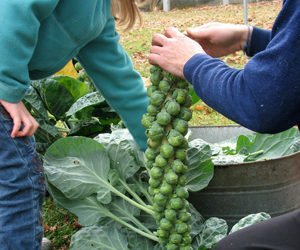 They require little care during growing or dormant seasons. Be sure to protect them from winter winds and mulch them to preserve moisture, however. And some perennials such as Lemon Verbena, Sweet Marjoram, and Pineapple Sage, that cannot survive winter in colder Zones, can be treated as tender perennials. Try transplanting them to indoor pots in a sunny room for overwintering. Regardless of whether your herbs are one-season wonders, reliably perennial, or indoor winter guests, early autumn is the time to preserve what’s left of their culinary gifts. Most herbs can be dried, and some actually work better for your recipes in their dried form. In general, the flavor of dried herbs is more concentrated than fresh, so you use a smaller amount to achieve the correct balance. 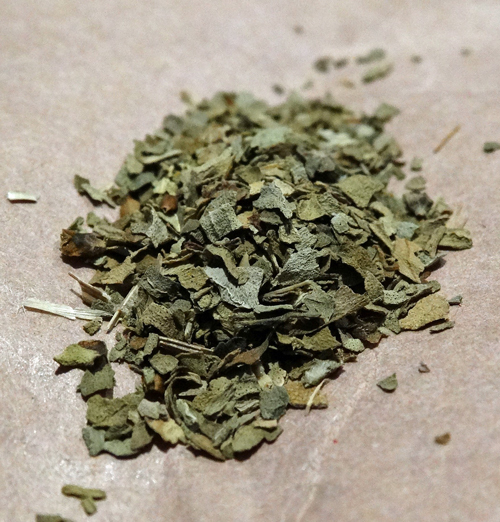 Although more concentrated, some herbs like Greek Oregano, are a little less bitter than when fresh. And Chives are sweeter and more delicate in their dried version. Herbs can be air-dried, oven, or microwave dried. For specific directions, check the Internet, especially agricultural extension sites. Of course, to simplify the process, you can use a food dehydrator. Once they are dry, remove any stems and crumble the herbs between your fingers. For dried Chives and the dried late-summer ferny leaves of Dill, snip into 1/8-inch pieces. One method for harvesting flavorful Dill seeds, is to wait until the Dill flower has turned brown but the seeds have not yet fallen. Carefully snip the brown flowers and place them head-first into a paper bag. Store the bag indoors and after a few weeks, the seeds will fall out of the flower into the bag. If any remain, give the flowers a gentle shake. For all dried herbs, store in airtight jars or plastic bags. If using clear storage containers, always store them in a dark place. Freezing is a fast and easy method of preserving your herbs, and fresh-frozen ones add that fresh herb flavor to your recipes, year-round. Freezing works especially well for soft-leaved herbs such as Basil. Start by rinsing the freshly cut herbs, lay them out in a single layer to dry for about an hour, then place in plastic freezer bags. Once frozen, you can break off the amount you need from the bag and return the rest to the freezer. 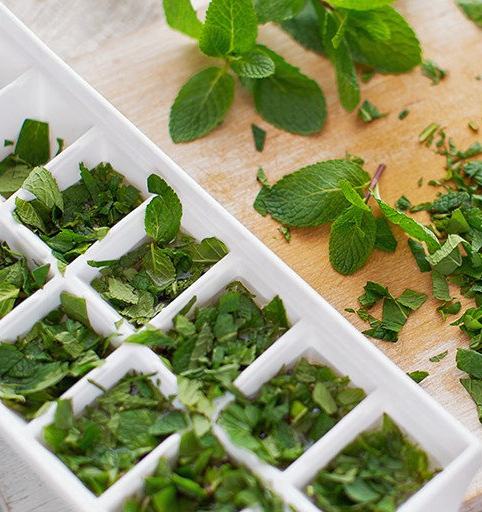 A quick and simple way to preserve your herbs in oil is by using ice cube trays. Remove the stems and chop up your freshly harvested herbs (Rosemary, Thyme, Oregano, and Sage work especially well.) Fill the ice cube tray wells half-way up with the herbs and cover each section with extra-virgin olive oil. Cover the tray with plastic wrap and freeze for at least 8 hours. Once frozen, you can remove the herb-oil cubes, place in freezable containers, and store in the freezer for use over the winter. These are wonderful used in soups, stews, roasts, or mashed potato topping! 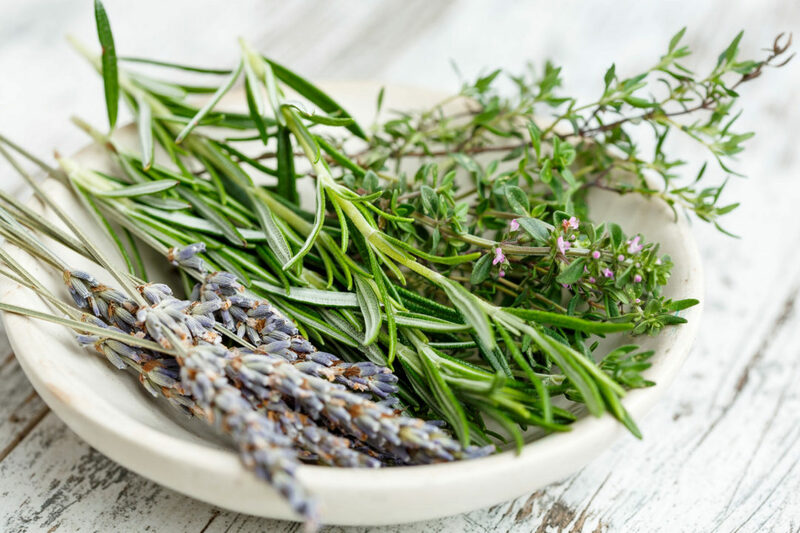 Stalky herbs like rosemary and lavender are commonly left in the ground, unharvested, to add interest to winter landscapes. If you choose to cut lavender back in the Fall, cut close to the ground. Bunches of dried lavender stalks are lovely in a tall vase and add a clean fragrance to any room. Aren’t edible gardens wonderful? And when you can extend their warm and lively flavors into the dark, cold months of winter, they are a true gift. Now is the time to plan next year’s herb garden – take stock of what you can save and order the rest for delivery at the perfect time for planting in your area. And if you’re short on space, check out our top herbs for container gardens. We grow all of our herbs organically and carefully select the best varieties of each type so you don’t have to guess!